New responsive Magento themes with advanced admin module, extremely customizable, easy to use and fully responsive design and suitable for every type of store. 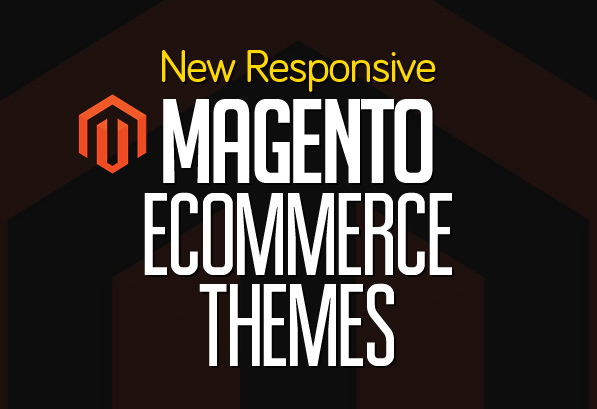 Magento themes will be the best website ever, stable quality, high speech, easy to use functions and many more powerful features you can find in every theme. The great thing in all these templates are that it isn’t having extra scripts and over animations, it’s just like decent template for online shopping. Mostly themes allow you to change the color of the template design with one click in the template settings. Using the color options you can have any color you wish. It adapts beautifully to all devices. Large size slideshow plus promotion blocks blow fresh air into the website and to make it more glamour and magnificent. Easily control your template layout and responsive layout via the template options and also theme designers and developers supply a full help and support to there products. Here is the list of Twenty High Quality Responsive Magento Themes for eCommerce Websites. Another fashion Magento Theme created for online fashion stores, accessories stores, shoes stores – Shaeng is a great choice for you. 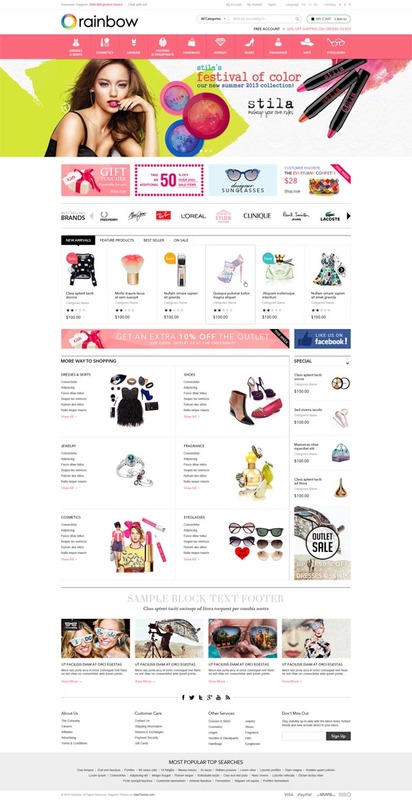 You can create a premium fashion product store with magento extensions and features. The layout of each home with main color : pink, blue, green – bring 5 other choices for you. Shaeng is a fully responsive theme. Interface will be automatically change and display logically and beautifully on any devices: desktop, laptop, ipad, iphone, smart phone. HTML5 and CSS3 have been integrated to increase the aesthetic for this website. Bestselling products, discount products, random products are displayed with slider in each tab. Featured products are shown per row or in slider. Allure Store is a premium Magento theme with advanced admin module. It’s extremely customizable, easy to use and fully responsive. Suitable for every type of store. Great as a starting point for your custom projects. We’ve been hard at work on a huge new feature for new Magento Theme and we’re excited to share a big move named ARW Leka. Introducing ARW Leka, a new responsive Magento theme to give your Magento store a rich and impressive look. FiverShop using the Slider Revolution Responsive jQuery Plugin. And We developed back-end control tools to Drag and Drap any Content such as Text, HTML, Video Image as layer to play on each slider. Because Everything (configuration, group,import, export) controls very easy and flexiable, you can make a new nices slideshow as expected in very short time. NewYear 2014 is comming and we have something special for you, that is the launch of the new responsive parallax magento theme, named MT Bolo. Inspiration of a colorful rainbow after the rain, Gala Rainbow will blow a fresh air to your online store. Colorful but it doesn’t make the store loose it own glamour dignity. A multi-layered slideshow which is integrated allows you to enhance visual effect, gain a more effective promotional tool, and emphasize important content. According to the current web trends, SM Saphi has an up-to-date design with clean flat design, neat typography, smooth navigation and well-structured layout. Webmarket is a responsive template for Magento. It is very easy to setup and use. 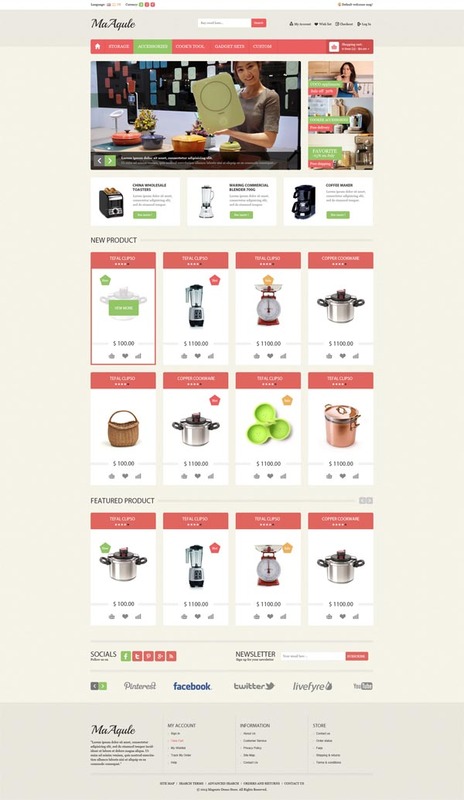 Aqule houseware is a responsive Magento theme of Plazathemes. Extremely nice and clean layout, and have many colors you can choose to build a website. This template has 6 pairs colors : red-green, red – black, red – yellow, black-blue, black-brown, black-green. . Its design is perfect for kitchen store, houseware store. Erida responsive magento theme is a our new style design. This template looks simple but very sophisticated and nice. With neat and clean structure, this template brings us fresh and comfortable feeling. This template use bootstrap application from Twitter. Besides, it has css3 effect with beautiful images and static blocks. ZENSTORE is a premium responsive multipurpose Magento theme which perfectly fits for any e-commerce website. This theme integrated many extensions such as : featured products with slider on the homepage, new products with slider on the homepage, pos logo, pos slideshow, products category with slider, scroll to top, specials products with slider on the homepage.. These extension make this theme more flexible. Let’s check out what you will get for this special template. You have shared an amazing collection of Magento themes!! I really like such kind of themes and will surely give attractive and appealing look to related websites.